When I arrived in Krakow airport, I walked to the rail station and took the tram downtown, where Renata was waiting for me. I was wearing the same clothes I’d had on since Friday, and I felt like I smelled bad in spite of the fact that I had taken a long shower in Paris earlier that morning. From there to Hotel Astoria in the former Jewish district of Kazimierz it was about a 15-minute walk that took us through Krakow’s Rynek (sort of a central square surrounded by restaurants, churches, museums and other attractions) and through narrow streets. Once settled at the hotel (where I met the receptionist that so kindly helped me over the phone during my Parisian ordeal), I showered, took a brief nap and changed. We then walked to Kwadrans (http://kwadrans.pl ), a nearby restaurant that boasted ‘authentic’ Polish cuisine. The atmosphere was rather cozy there. We ordered two glasses of Warka beer, a serving of pierogi and another of krokiety (Polish –style fried croquettes) filled with cabbage and mushrooms. An interesting thing I noticed about restaurants in Poland – at least the ones we visited – was that there was no waitress service. You order your food at the counter, and when it’s ready you pick it up and take it to your own table. I must say that we weren’t impressed by the food there. Everything tasted like store-bought reheated frozen food. They over-use chicken bouillon, so that was all you could taste. Renata agreed with me that we had better experience at Staten Island’s Polish place in St. George. Thankfully, that was the sole negative culinary experience we had during the entire trip. We proceeded to walk around more around the rynek area. After an hour or so, we stopped at one of the many street food joints, where I ordered a zapiekanka – a favorite Polish snack that I had been looking forward to since I started doing research on the trip. For those who don’t know, zapiekanka is a halved baguette filled with chopped sautéed mushrooms and topped with cheese and a liberal amount of ketchup. Like pizza, zapiekanka can be had in all kinds of styles, but the best is the standard form I described above. It’s delicious, inexpensive (around Krakow it went for about 4-5 zloty – about $ 1.50) and quite filling. Later that evening, we also visited the Museum Narodowie http://www.muzeum.krakow.pl, where luckily patrons were admitted free of charge on Sunday. Our original plans included a visit to Zakopane in the Polish alps, but as we stopped for a drink at a bar not far from our hotel, we realized that due to my delay in New York, I wouldn’t have a chance to see much of Krakow, so right there we decided to book an extra night at our hotel and skip Zakopane altogether. As we enjoyed our drinks, we ran into a group of Brazilian tourists who were looking for something to eat. Unfortunately, the kitchen was already closed, so they left to find some other place. On our way back, we stopped at yet another bar where we watched a volleyball match between Poland and Germany – a hard battle in which the home team prevailed. After a hearty breakfast at the hotel the next morning, we headed to the Krakow Visitors center to pick up our Krakow Tourist Card, which allowed us to take city buses and trams free of charge (the card costs about $ 20). 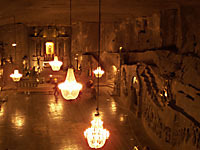 After a visit to the local mall, we took a bus to the nearby town of Wieliczka to see the 700-year-old salt mine there – today part of UNESCO’s World Heritage List http://whc.unesco.org/en/list/32 . It’s important to note that Unlike Warsaw, Krakow survived World War II virtually intact, so most of the ancient buildings around the city are in their original form. The tour, which takes about two hours, took us 135 meters under the earth, where we saw trails built by miners centuries ago, as well as sculptures made from rock salt. Almost at the bottom of the mine is a large church where late Pope John Paul II (who is revered in Poland for obvious reasons) conducted mass years ago. There is a recent sculpture inside the church memorializing the pontiff – of course made of salt. It was raining relentlessly in Krakow during my visit, but that didn’t seem to slow us down. We missed our stop, and the express but ultimately dropped us off on the other side of town, where we found a small restaurant called Smak http://www.inyourpocket.com/poland/krakow/restaurants-cafes/Polish/Bar-Smak_41618v . Wary of what we had experienced the day before, we took a chance and placed our orders as we enjoyed a glass of Zwiec beer. I had bigos (cabbage and sausage stew), while Renata again went with Krokyety and a bowl of borsht (fermented beetroot soup). The food was surprisingly good, and we were happily satisfied as we took the tram back to our hotel. 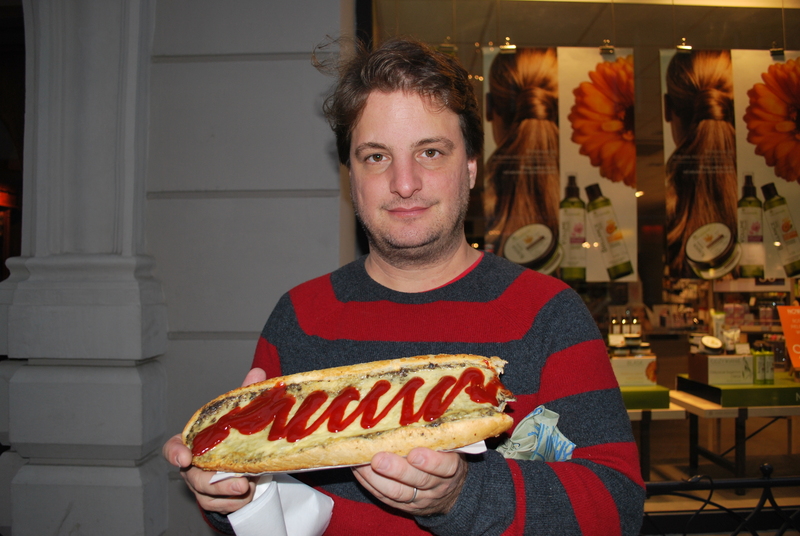 As we made our way back to our hotel room, we found one of Krakow’s most celebrated zapiekanka joints located at what was formerly a kosher butcher shop, and after Renata tried it, we promised to return the following day before our departure. We woke up early the next day to visit the 15th Century Wawel Castle http://www.wawel.krakow.pl/en/index.php , one of Krakow’s main historical attractions. Formerly the residents of the kings of Poland, the castle went through a lot of changes during the years as different rulers made changes to its structure. Now restored to its original glory it has several exhibits, including tapestries recovered from both Russia and Germany, military artifacts and paintings. The administrators have a dodgy way of charging admittance as each exhibit is individually priced – meaning that taking the full tour could cost you quite a bit. We walked around for a few hours and ended the visit by going through the dragon’s den, an underground cave that leads to the outside of the castle, where a sculpture of a dragon spews fire every few minutes. We packed our bags back at the hotel and left them in lockers and went to Jama Michalika http://www.krakow-info.com/michalik.htm, a café not far from the central square. Once a gathering place for intellectuals during the early years of the 20th Century (it has been in business since 1895), where I had an excellent cup of espresso followed by a chalice of cognac (the price was a bit steep: about $ 12 zloty, which is a lot for Polish standards). Renata had a dessert and a cappuccino. 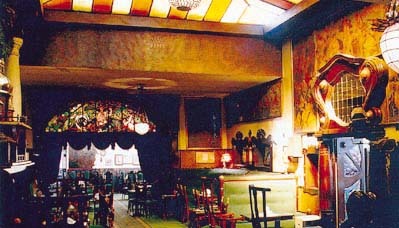 The décor dates from 1908, and it is now a major tourist spot where visitors stop for quality food and other delicacies. As the clock wound down on our stay in Krakow, we went back to Kazimierz for zapiekanka and also to the hotel to pick up our bags. We took a tram to the mall, and walked through it to get water and other supplies. Behind the mall is the bus station where we purchased our bus tickets and waited for the trip that would take us to Chełm, Renata’s native town. Krakow was a very interesting experience. It was my first experience in Eastern Europe, and in spite of the fact that I saw very little of the city’s famed nightlife, I have very fond memories of our stay there, and am looking forward to return for a more lengthily stay very soon. Thanks. There are several ‘authentic’ Polish restaurants in Krakow, but there is a lot of international cuisine. During our visit, we spotted Argentinean, Japanese and Spanish restaurants – we didnt go in though, as the prices there are considerably higher than in restaurants that serve local fare.